Visit REAL Yummy Food's profile on Pinterest. I finally took the plunge and quit coffee last month! YAY ME! And after creating this DELICIOUS matcha blended latte I haven’t looked back since!! You may be wondering what matcha is. It’s a type of green tea grown in Japan that has been used for at least hundreds of years in traditional Japanese tea ceremonies. Buddhist monks are also known to drink it to assist in meditation because of the calm alertness it provides through its caffeine and amino acid content. It is rich in nutrients, chlorophyll, amino acids, fiber, antioxidants, epigallocatechin gallate (EGCG), polyphenols and more giving it incredible health benefits and also a unique, creamy taste known as umami. It’s so much tastier than coffee (to me) and I no longer have the afternoon crash I was having before! I always knew I liked matcha, but at $7.50/cup my bank account wasn’t very fond. Also knowing about all the health benefits of matcha makes me do one big happy dance as I drink my cup each morning. If you know me, you know I’ve been on a journey of improving my health and the health of my family for many years. This is my new must-have and it being so much healthier than coffee, makes me feel absolutely amazing about this switch. I know a lot of people that have been wanting to quit coffee, and I was asked if I got headaches by a member of my real food group when I quit coffee last month. The answer is yes. And the truth is that I have quit coffee MANY times on this health journey I’ve been on over the years, and every time I have gotten headaches. I will note though that the very first time I quit, the headaches were the worst and lasted maybe 3-4 days at most. Other times, the headaches intensity was lessened and would only last 1-2 days. Last month, I got some headaches and was extra tired for only 1 day. It wasn’t too bad. Giving yourself some caffeine from tea like matcha (plus all the yummy antioxidants) or from yerba mate will surely help reduce the pain. At the end of the day, if you want to quit coffee then you should! Take the leap. Better sooner than later, right? I believe it is important to honor yourself and your wants, and we usually know what need more than anyone else. It is important to listen to our intuition and speaking from experience, if something you’re doing isn’t making you happy, then it’s time to rise up and honor yourself! Now, I’m not saying everyone should quit today, but if it’s something that YOU have been wanting to do, why wait any longer? Take the leap. Order some matcha here today! This is the ceremonial grade brand I use. And here is a link to an awesome matcha bamboo set that includes a bamboo whisk, scoop and teaspoon. Matcha can be made hot, iced, or blended. I personally love it blended best, and my recipe is as follows. If you give it a try, let me know what you think of it! Enjoy! Blend all ingredients together in a high speed blender. Enjoy! I like A LOT of matcha each morning, and this recipe yields a little over 4 cups, but feel free to cut it in half if desired! Lyndsy Karrie is the founder of REAL Yummy Food and a pioneer in the world of healing people with food. After being distressed by her son’s severe autism diagnosis she spent every waking hour researching and testing ways to help her son and family. What she found was astonishing. Now she shares her knowledge and easy-to-make, nutritious recipes while promoting clean eating in a non-toxic environment. Join her in keeping it REAL. Hi! 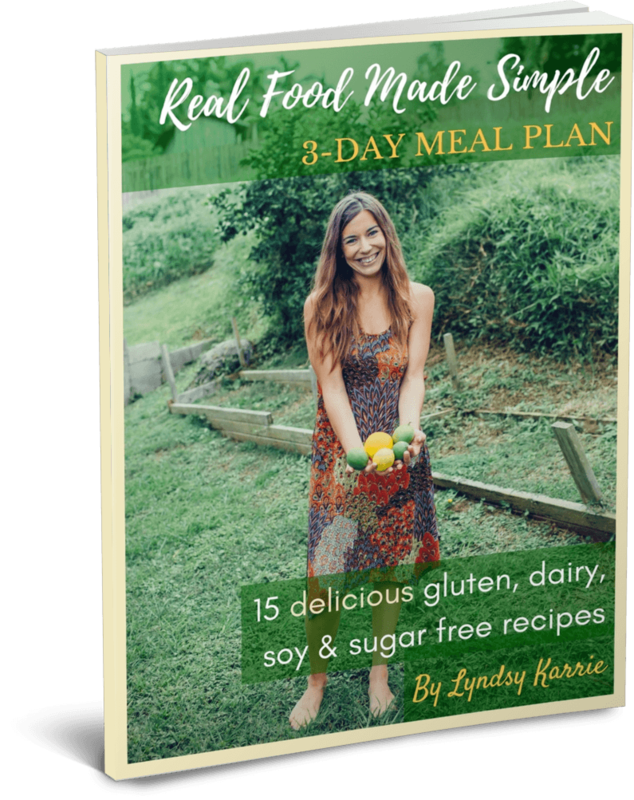 I'm Lyndsy Karrie and I love sharing real food recipes. Why? Because removing processed foods, added sugars, GMO's, and other toxic additives from my home has been life-changing for me and my whole family, and especially for my son who regressed into severe autism after a vaccine injury when he was little. He was nonverbal, in diapers, couldn't sleep and self-injurious until the age of 5 with sensory processing disorder. Instead of using pharmaceutical drugs and treating symtpoms, we decided to go the holistic route and get to the root of the cause. As we made drastic changes to our lifestyle, detoxed ourselves and our environments, all my son's sensory issues disappeared, and the fog was lifted! Now I love sharing what has worked to get my family healthy again, and hearing how others are healing and keeping their families healthy too! 15 delicious gluten, dairy, soy & sugar free recipes!